Mount Royal and its hydrology have played critical roles in the health and recreation of Montrealers. In this second post in a series on Placing Montreal, two students from Claire Campbell’s Canadian Studies 405 (McGill 2013) explore the places of Montreal and their significance to Canadian Environmental History. Two of these places were central to the city’s landscape and its ability to provide fresh drinking water, although one place is unmistakable and the other goes mostly unnoticed. Michael Haefner argues that the now hidden McTavish Reservoir “serves as an example of urban planners taking advantage of their city’s unique environmental aspects.” Katherine Konn’s paper focuses on the city’s most prominent landmark, and shows how Mount Royal has been used and imagined for widely varying purposes over the centuries. Excerpt from Michael Haefner, “Uncovering the McTavish Reservoir.” For the full paper from Canadian Studies 405 (McGill, April 2013) . On the slope of Mont Royal, engineers carved the McTavish Reservoir into the lower slopes of the mountain between 1853 and 1856. The reservoir was to provide the city with water for domestic purposes and to fight fires. The growth of industry and railroad construction around Montreal resulted in a larger business district and a greater population, requiring more resources for fighting fires. Thomas C. Keefer designed the reservoir. Unlike Montreal’s one other reservoir located on today’s Saint Louis Square, Keefer designed the McTavish to have two basins; this way maintenance could be undertaken on one while the other still held water. Also, Keefer placed the reservoir at a higher elevation, on the slope of the mountain. Mont Royal, the mountain that lies in the center of the island of Montreal provided the city a unique opportunity that other cities did not possess. At great cost, cities without mountains had to build their reservoirs high above the surface to provide any pressure for pumping the water to citizens. In Montreal, Mont Royal already rose above the city and by constructing the reservoir on its slope, there would be enough pressure to fulfill domestic needs and if necessary, help combat fires. Furthermore, the reservoir was centered on the downtown of the growing city to prevent decreases in water pressure. Fires were in the forefront of Keefer’s mind while he drew the plans since Montreal had experienced several large fires in the past. The most recent fire had been in 1852 and at the time, the only reservoir built had been emptied for maintenance and over 10,000 people lost their homes—remarkably, no deaths were reported from the fire. Also, by constructing the reservoir on the mountain, it was kept at a distance from the actual city, which still hugged the shore of the St. Lawrence River. Building the reservoir at a distance from the city was keeping with the practice of separating basic urban hygiene needs such as hospitals and cemeteries from the city proper. Over the course of the 19th century, the McTavish Reservoir was expanded to hold 37 million gallons of water for the growing city. In 1932, at the site of the reservoir a new pumping station was built to move water from the McTavish Reservoir to the Outremont and Côte-des-Neiges reservoirs. The construction of the pumping station is indicative of the growth of the city towards and around Mont Royal. The McTavish pumping station was built in the Chateaux style so as to blend in with the architecture of the area. Beginning in 1910, new discussions arose concerning the quality of the water provided to the city. An outbreak of typhoid in the city led to all new reservoirs being constructed with covers, McTavish Reservoir would not be covered until after World War Two, however, due to a lack of funds during the Great Depression and the war. Covering the reservoir would also save the city money since it would stop the reservoir from freezing over during the winter, which damaged the basins and cut down on the amount of available water. Since being covered, the McTavish Reservoir appears to the unknowing eye as a simple grassy field above downtown Montreal. In 1874 Frederick Law Olmsted was hired to design the Mount Royal Park … Olmsted considered beautiful scenery to be an effective therapy against mental disease and supportive of overall health. For this reason, Olmsted’s approach to designing the mountain park was based on accentuating existing natural features. Olmsted divided the area into 8 sections, and reasoned that the characteristics of each 8 features must be emphasized, idealized, and made more apparent in landscape quality. By intensifying and idealizing the special qualities of each topographical division, Olmsted made the mountain look taller and more mountainous. Olmsted also believed the dramatic views from the mountain were best experienced in successive incidents. For this reason, he designed roads originally meant for carriages, which worked their way gradually up the side of the mountain through the forest broken by occasional glimpse through the trees. In regards to the roads, Olmsted concluded that the topography of the site must dictate the route. Thus, the design of the roads winds around knolls, depressions, and even valuable trees. However an issue with the park at its creation, and thereby the majority of the mountain which it dominated, was that it was fairly out of reach to the poor, as it was situated close to the wealthy, primarily Anglophone parts of town. Until 1885 when an incline railway was erected, it had been virtually impossible to reach the park without a carriage, which contributed to the image of the park as a garden for the wealthy. Even by the end of the 19th century, Mount Royal was not conceived as being in the city proper due to the lack of accessibility. It wasn’t until the 1920’s and the decision to build a streetcar line that the imagined distance between the city and mountain began to shrink. This was an important transition in the relationship between the city and the mountain. The construction of the streetcar line changed the very significance of the mountain, as it was no longer located on the periphery, but in the heart of the urban space. The large degree of human design that went into constructing the mountain park that exists today continued into 1938, when landscape architect Frederick Todd designed Beaver Lake. However, the placement of this lake was influenced by the reservoirs, which had been constructed on Mount Royal in 1853 to facilitate the conveyance of drinking water throughout the territory of Montreal. The supply of water to Beaver Lake was made possible by the pumps, pipes and reservoirs concealed in the increasingly discreet infrastructure of the mountain’s water supply system. Thus, Beaver Lake replaced the reservoirs as the mountain’s best known water feature. This further demonstrates the binary quality of the mountain as a faux-rural and natural environment and an urban supplier of goods. The environmental history of Mount Royal demonstrates the many ways a natural geographic formation is used and manipulated over time to fulfill the needs and desires of the surrounding population. This distinctive geographical landmark has shaped settlement patterns and land use by both Aboriginals and Europeans. At first just a topographical feature, the mountain started to transform into a usable space for the city beginning with the settlement of elite members of society at its base. The construction of reservoirs then made use of the mountain as a water tower. The establishment of the cemetery signified that the mountain could be used as a semi-public space. Finally the park, while initially only catering to the elite who could access it, gradually opened up the mountain to more people across all demographics. Susan M. Ross, “Hidden Water in the Landscape: The Covered Reservoirs of Mount Royal,” in Metropolitan Natures: Environmental Histories of Montreal, ed. Stephane Castonguay and Michele Dagenais (Pittsburgh: University of Pittsburgh Press, 2011), 118-119. John Kalbfleisch, “The Great Fire of Montreal,” in The Montreal Gazette (Montreal: July 12, 2003). Ross, “Hidden Water in the Landscape,” 118-119. Charles J. Desbaillets, “The Montreal Water Supply,” American Journal of Public Health (6), 1932: 627-632. Ross, “Hidden Water in the Landscape,” 125. A. L. Murray, “Frederick Law Olmsted and the Design of Mount Royal Park, Montreal,” Journal of the Society of Architectural Historians 26.3 (1976): JSTOR, University of California Press, <http://www.jstor.org/stable/988363>. Susan M. Ross, “Hidden Water in the Landscape,” Metropolitan Natures: Environmental Histories of Montreal. Ed. Stephane Castonguay and Michele Degenais. (Pittsburgh: University of Pittsburgh, 2011), 120. Nadine Klopfer, “”Terra Incognita” in the Heart of the City? 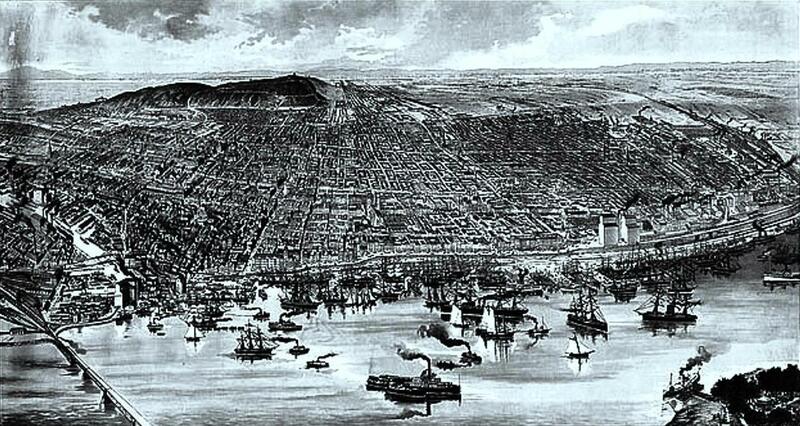 Montreal and Mount Royal Around 1900,” Public Space and Ideology of Place in American Culture, Ed. Miles Orvell and Jeffrey L. Meikle (Amsterdam: Rodopi, 2009), 145, 150. Susan M. Ross, “Hidden Water in the Landscape,” Metropolitan Natures: Environmental Histories of Montreal. Ed. Stephane Castonguay and Michele Degenais. (Pittsburgh: University of Pittsburgh, 2011), 122, 123.